Coming across a snake in the midst of the road can be really scary. 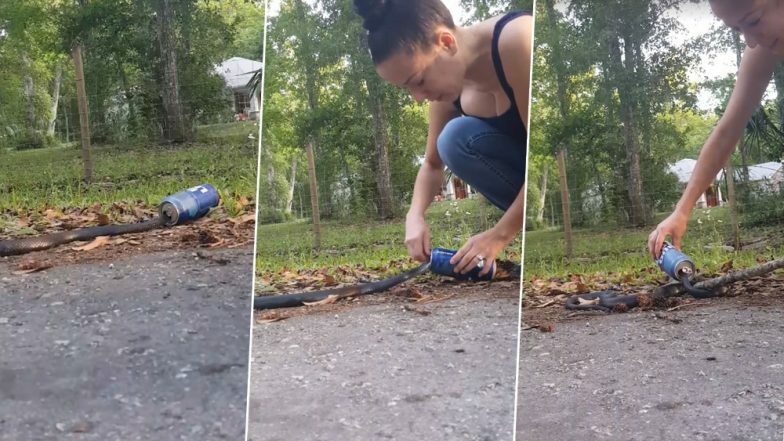 But a woman from Brooksville decided to set aside her fears to rescue the slithering reptile who needed help. A woman named Rosa Fond was driving across the road when she saw a snake who was in distress. The snake had its head stuck within a can of beer. Although Fond was scared of snakes, she runs an animal rescue center and knew she had to step in. She helped the snake with a stick and managed to get its head out and free it. Australian Woman Finds 4-Metre-Long Python Next to Bed Apparently Wanting to Eat Her! Rescues Herself, Watch Shocking Video. Rosa Fond is the owner of Humans and Animals United Rescue. She also made a video of her saving the snake and in the video, she can be heard saying, "I gotta save a snake! Oh God, I don't know how I'm going to do this!" She mentioned that she did not have the courage but she had to save the poor animal. The snake even wrapped around her arm twice while she was rescuing it. "It was a battle but I saved her. All for the sake of the animals." It was a black racer snake, which is known for going after people. Venomous Tiger Snake Brings City Traffic to Halt in Melbourne, Watch Rescue Video. Talking about her successful attempt, Fond told Channel 8, "I couldn't let her die. I know in this area, if someone gets a hold of that, they will probably torture the animal." She mentioned that after the snake was rescued it waited there for a while and rattled its tail. She has rescued other animals in the past including alligators but she was never fond of snakes. But she made the courage of the slithering animal which needed help and was happy about it. She even took the beer can as a souvenir back with her.